Exactly thirty-one years ago today one of the most infamous incidents of modern baseball history occurred. The game involved the visiting Kansas City Royals taking on the New York Yankees. The Yankees were leading the game 4-3 with 2 outs in the top half of the 9th inning. George Brett was at bat and hit an incredible 2-run home run off of Yankees pitcher Rich “Goose” Gossage. The Royals were suddenly in the lead by one run. That is until the Yankees manager Billy Martin left the dugout to speak with home plate umpire Tim McClelland. Martin explained to McClelland that Brett’s bat had pine tar exceeding the normal length allowed on the bat. This pine tar place on the upper part of the barrel of the bat would make the bat easier to hit the ball solidly off the bat. McClelland then measured the bat’s pine tar (which was allowed to be more 18 inches up the bat) with the home plate. The pine tar was over that length, McClelland immediately over ruled the play and called brett’s at bat as an out. 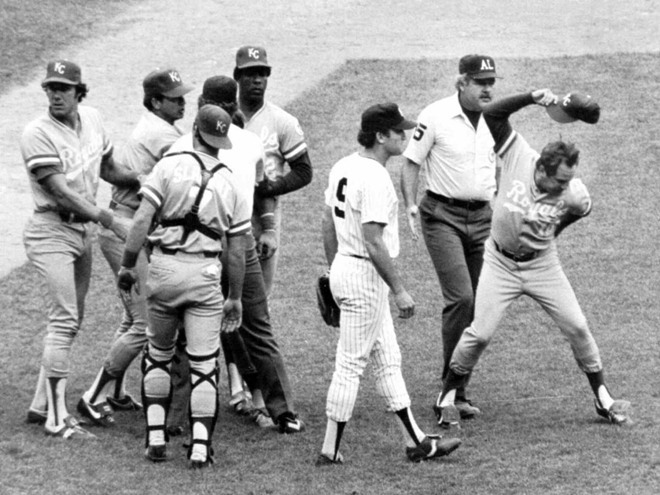 George Brett then stormed toward home plate to confront Tim McClelland. Brett was restrained by his team mates and was brought back into the dugout. Due to the umpires call the game was now over. The Yankees were recorded as the winners of the game by a score of 4-3. The call was later over ruled and a few weeks later the game was restarted after Brett’s at bat with his 2-run home run counting. The Royals won that game 5-4. This is a moment that will live forever in baseball history. It is also George Brett’s most memorable moment in his Hall Of Fame career.